Good Morning!!! 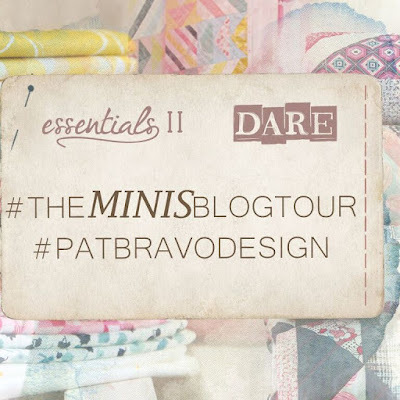 I am really excited to share my mini quilt I made for The Minis Blog Tour with Pat Bravo using her beautiful fabrics. 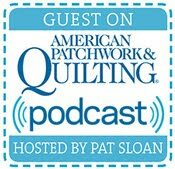 A few weeks ago, on Instagram, designer Pat Bravo had a post where she asked all the makers out there if they would like to sew along with her. I jumped at the chance and put my name in the hat to be part of the blog tour. I was really happy and honored to be chosen...and then I got really nervous. I got to work with the blush colorway from Pat's Essentials II line. It was so pretty! Right away I set the stripes aside for binding. I also received the Dare to be Bold colorway from Pat's Dare line. 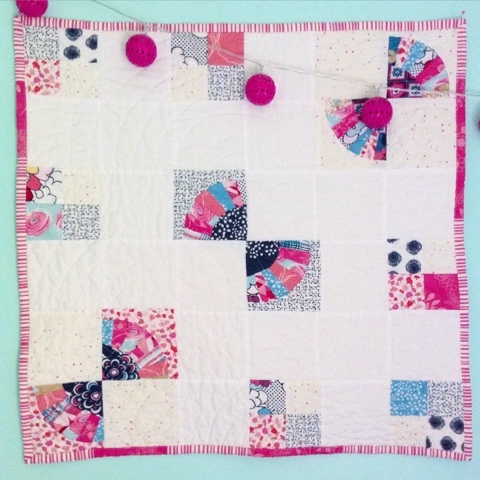 It is such gorgeous fabric and played beautifully with Essentials II. 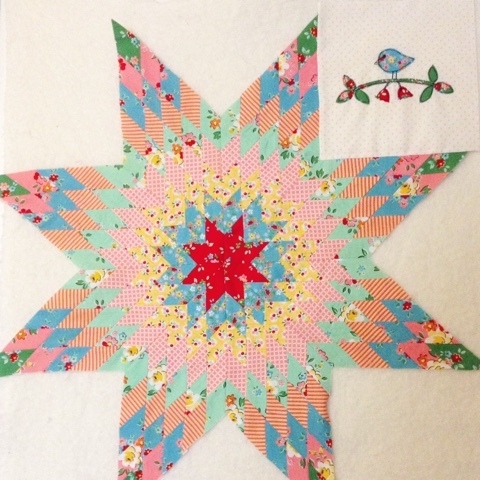 I knew right away I wanted to make a Grandmother's Fan quilt. I hadn't made one in about 10 years. 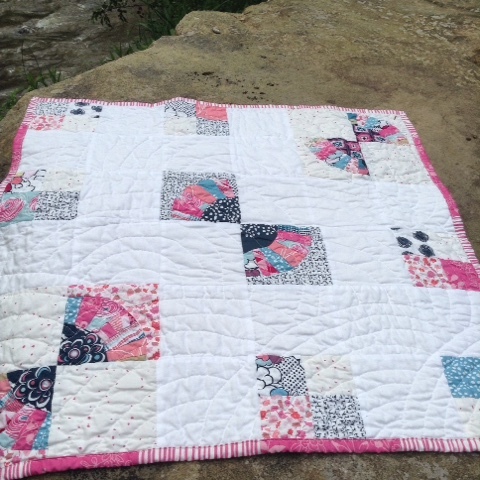 That quilt was for my daughter and the pinks I was working with for this mini really reminded me of that quilt. I also knew that I wanted it to have a modern feel to it. I wanted to step outside my box a little. I started by cutting the blades of the fan with scissors improv style. It was fun but they all looked very similar in size and not very improvish at all. That's okay though. I'm really happy with the way they turned out. They finish at 4"!!! I love how mini they are. I wanted to use all the fabric and I did. 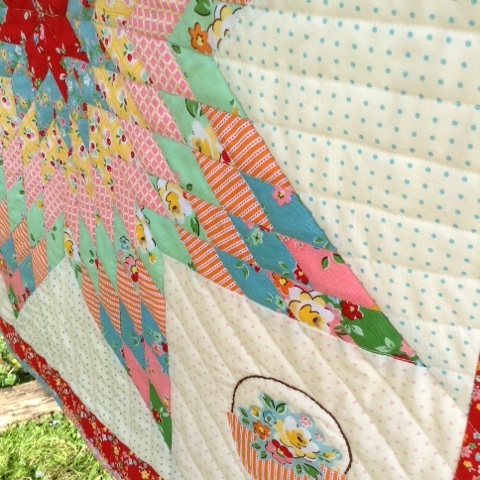 But I had to continually tone the quilt down as I went. Here is my initial layout. 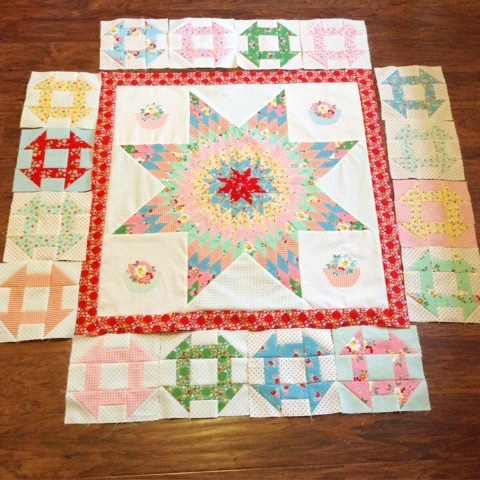 I mixed the 3 Grandmother's Fan blocks with several four-patch blocks and squares. 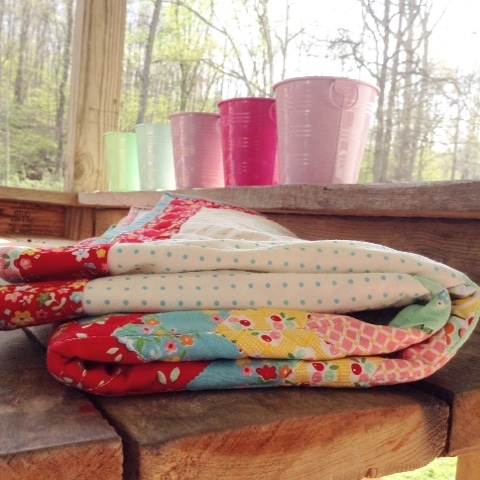 I wanted to showcase the fabrics but it was a little busy for what I wanted. 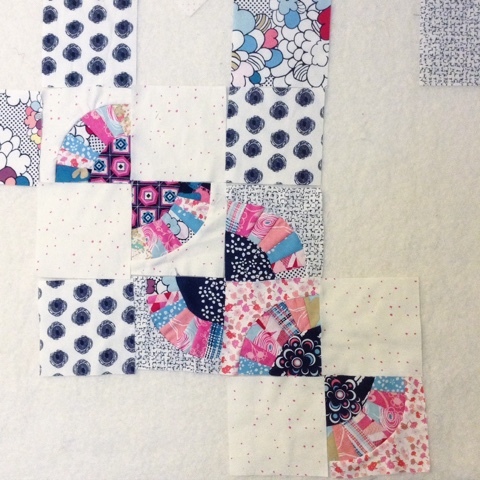 I started taking out some of the printed squares and used white solid in their place. It was coming along but I still was unsettled. It was one of those moments where what you envisioned wasn't happening. 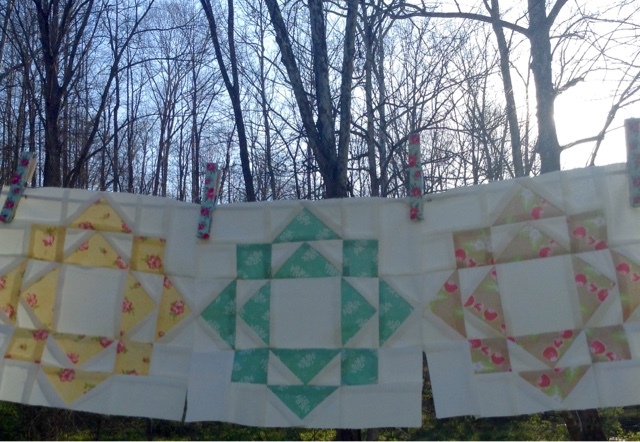 I had used all of the fabric within the 6 Fan blocks and I wanted to focus on them but the layout was wrong. And so after going outside to play with the kiddos for a little. I came back in to work and decided to separate the fan blocks. I rearranged them and I liked that. But I wanted a more clean, crisp look with a bit more order to it. 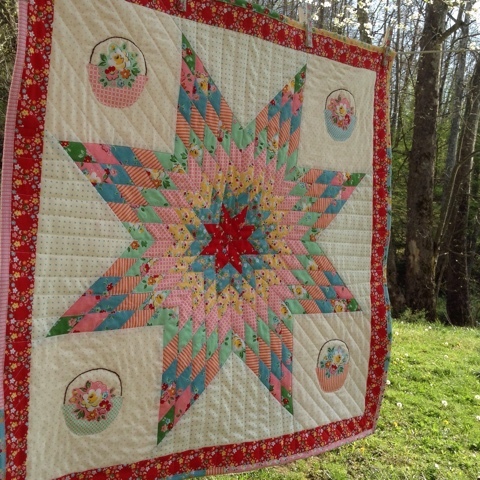 I have been wanting to try quilting the Baptist Fan pattern for so long. I thought now might be a good time to try it in keeping with the whole fan thing :) I didn't mark any lines. 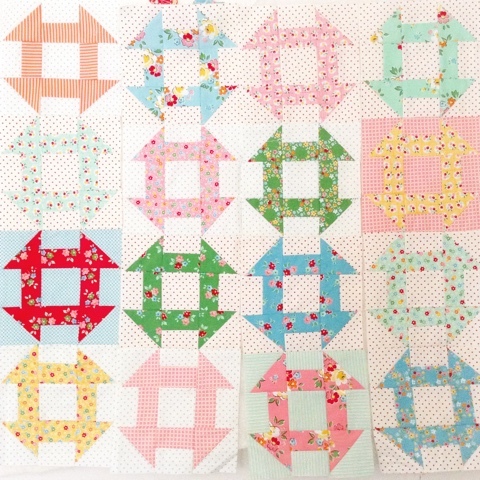 So it doesn't look like the traditional quilting pattern. I used my free-motion foot and just decided to wing it. My lines are wobbly in some places and quite uneven but I really enjoyed the process. 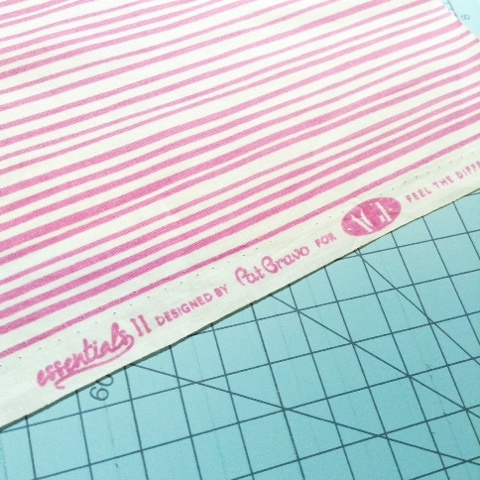 Here is the stripe that I saved for the scrappy binding. 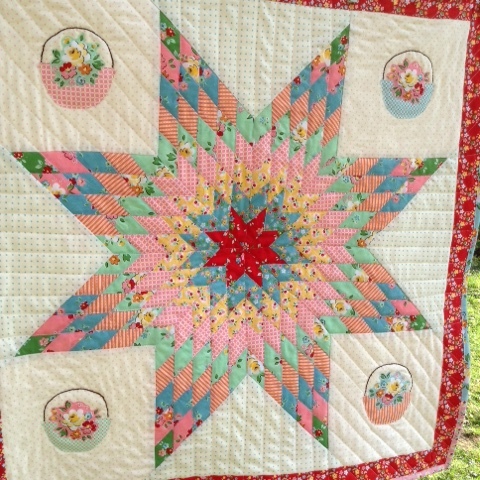 I took a quick shot of this because I loved the pretty speckled pink dots next to the stripes! Isn't it so simple and pretty?! Both of these prints are definitely "essentials". Here is the full shot of it! 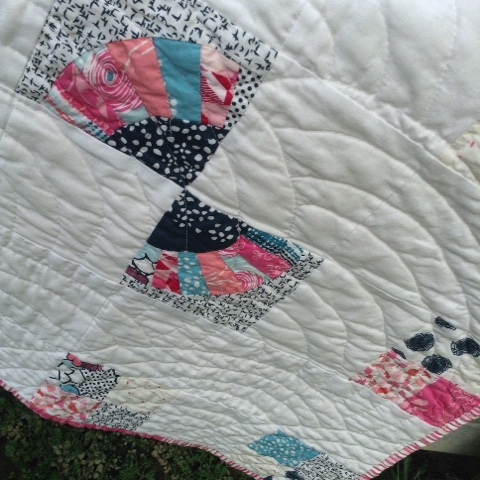 I used a few pops of the more saturated pink floral in the binding. 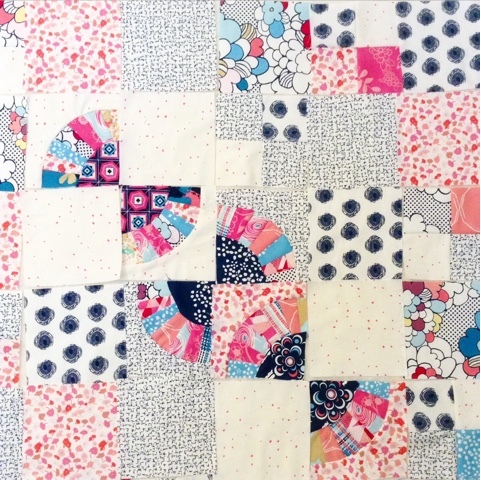 The hand of the fabric along with the quilting make such a wonderful texture for this quilt. 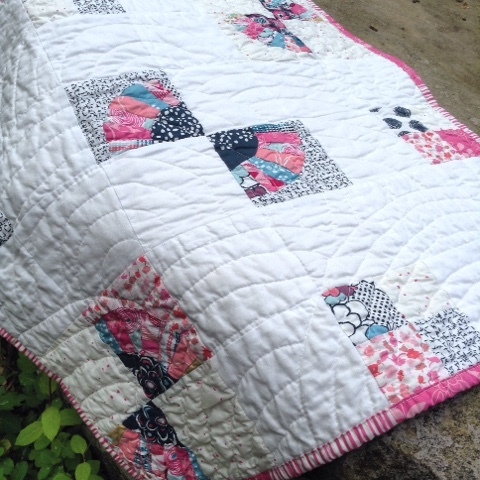 This was such a fun quilt for me. I'm happy it turned out pretty much how I envisioned it even though I had my doubts for a second there. Now it's hanging in my daughter's room. She asked if she could have it and of course I said yes! I am always overjoyed when my family likes what I make. 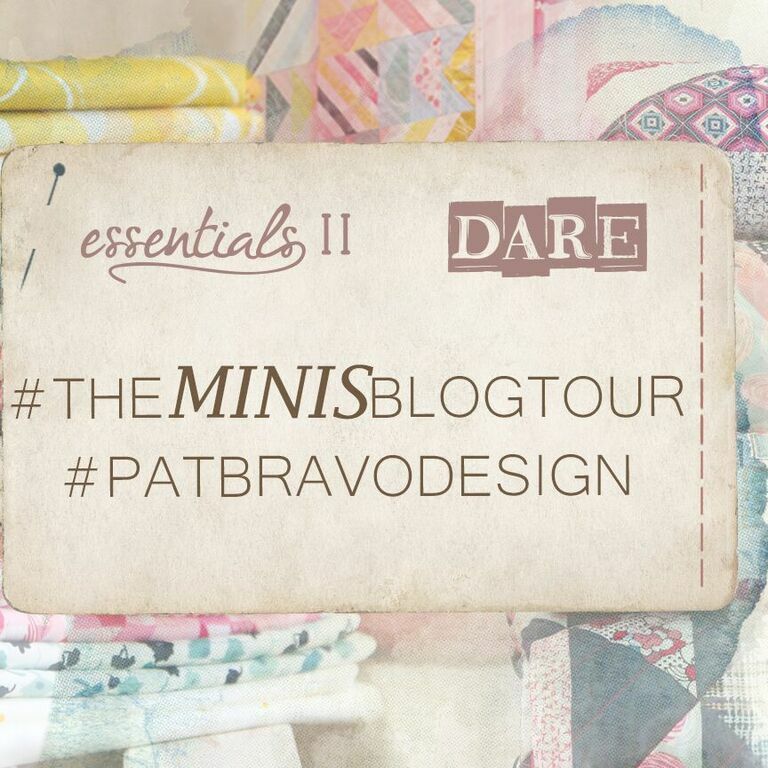 Thanks so much to Pat Bravo for the beautiful fabric and the chance to participate in such a fun blog tour! Here is a list of the other participants. 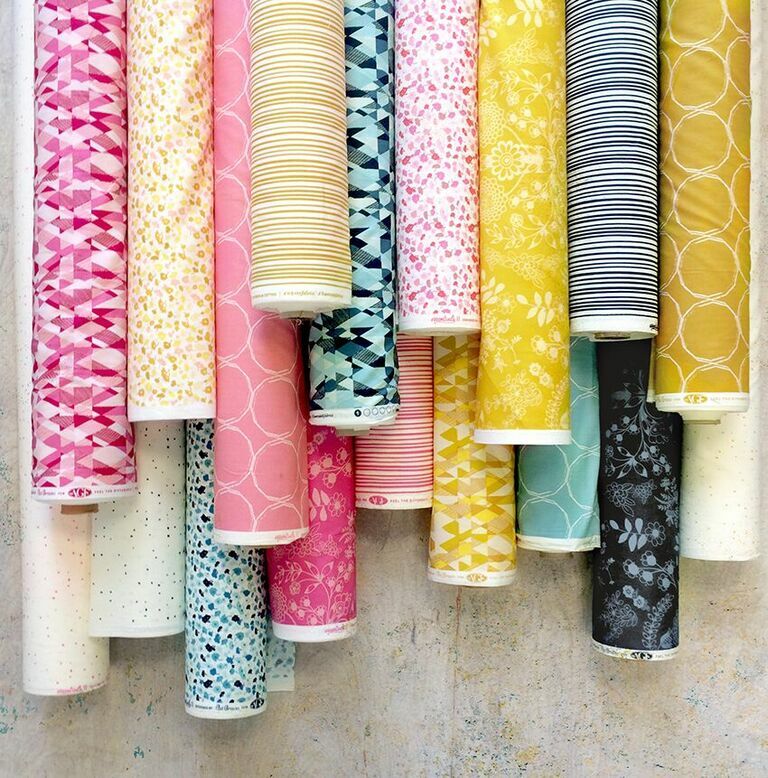 Be sure to check out all of the pretty minis being made! 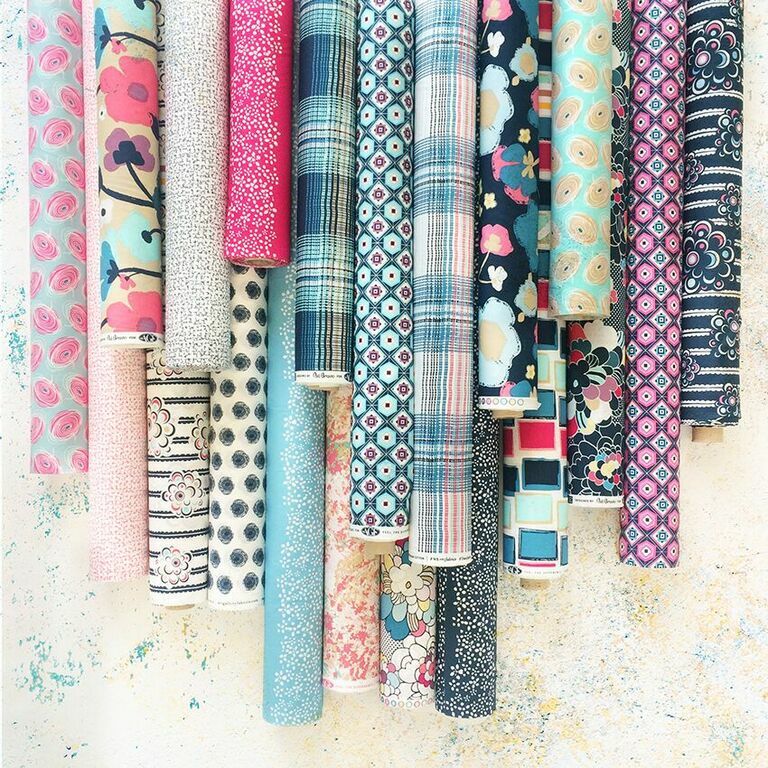 I am also giving away a pretty scrap bundle of the fabrics I used for my mini. Just leave a comment to enter! 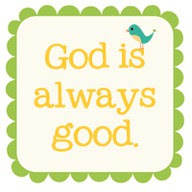 Good Morning!!! 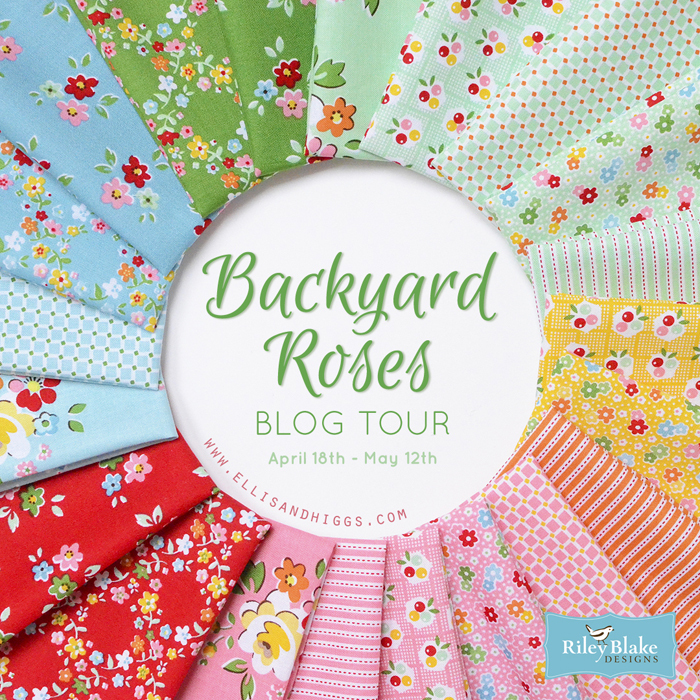 Today is my stop on the Backyard Roses Blog Tour. 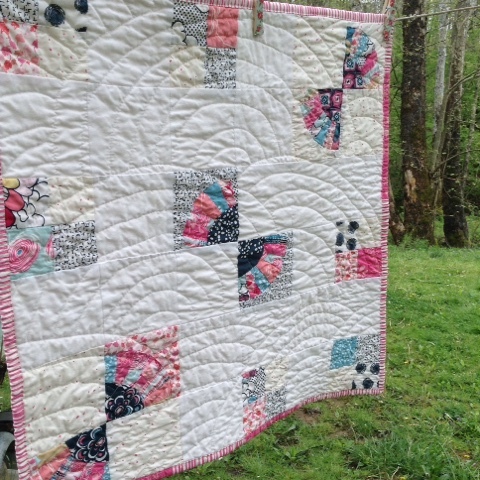 I'm sharing a project I made using the beautiful new fabric Backyard Roses created by my friend Nadra Ridgeway of Ellis & Higgs for Riley Blake Designs. 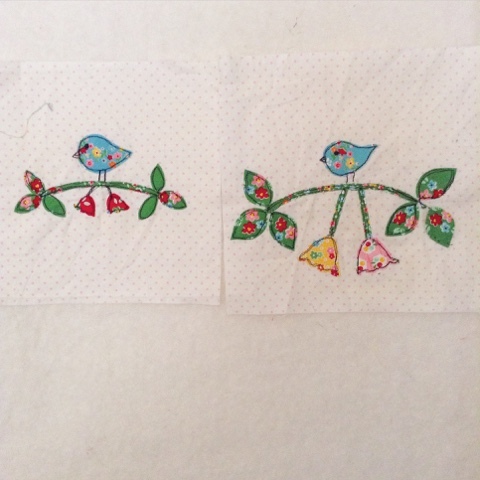 This fabric has such a sweet vintage feel to it. There are rich, saturated colors as well as softer, more pastel colors. I love it! 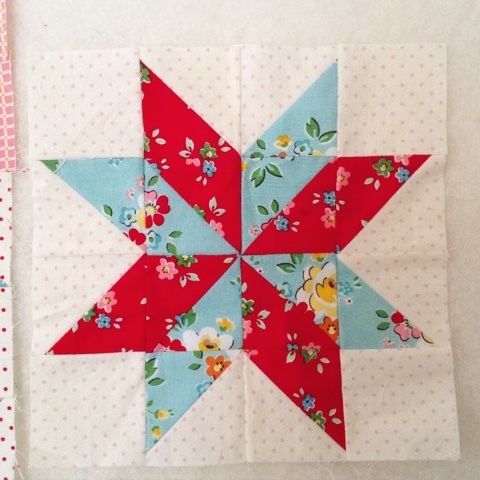 I knew right away I wanted to make a Lone Star quilt with it. 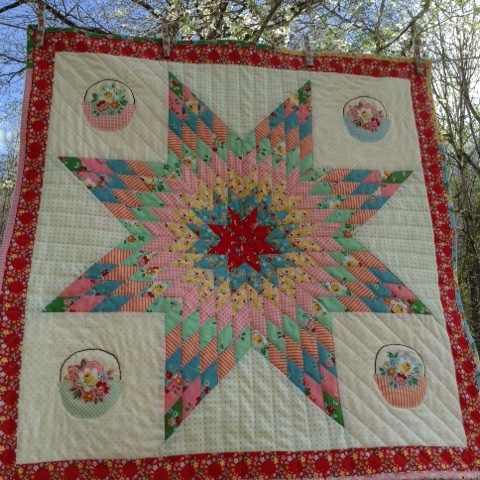 The colors really reminded me of a vintage Lone Star quilt. I took pictures of the entire process in hopes of sharing a tutorial for it sometime in the future. I thought this looked really neat. I love the red center star. So after I got the star finished I had so many ideas of what to do next I made up a few different options to see what I liked best. 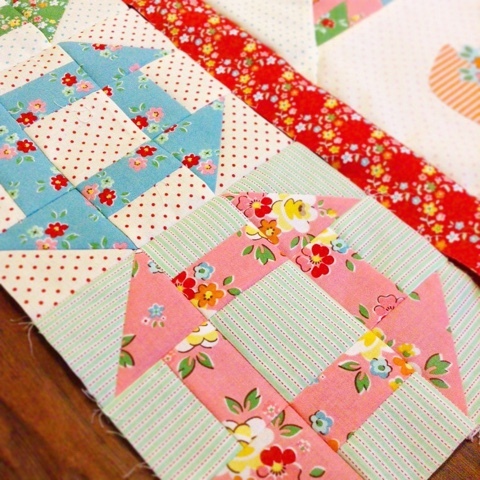 I wanted to use some applique on the set in corner squares and maybe even the triangles too. I tried birds first. I didn't like my first 2 attempts at all. After the time and work that goes into the Lone Star I really wanted to make this just right as well as show case these pretty fabrics. I did like these birds but I decided against them all together. 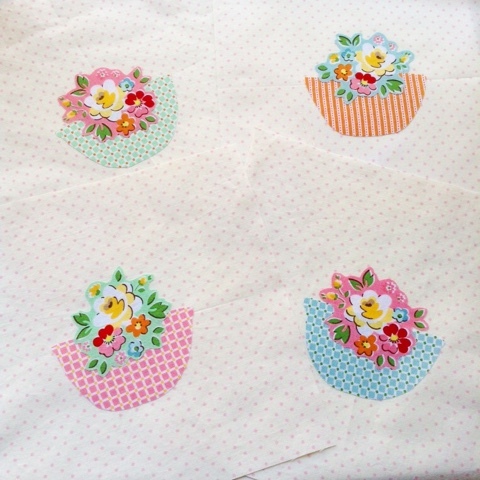 I decided to fussy cut the beautiful roses from the larger floral prints. I used the checked and striped fabric as baskets. 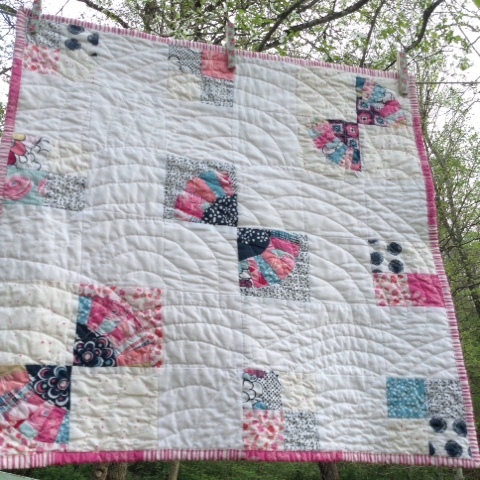 I appliqued them to Riley Blake baby pink Swiss Dots. Later, I embroidered handles on the blocks with a brown colored embroidery floss. 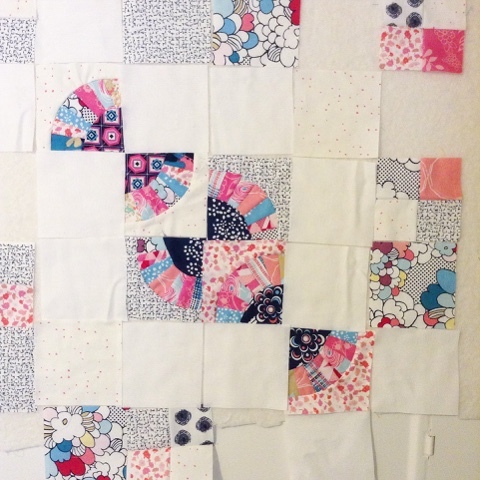 I thought a lot about making a round robin style quilt. 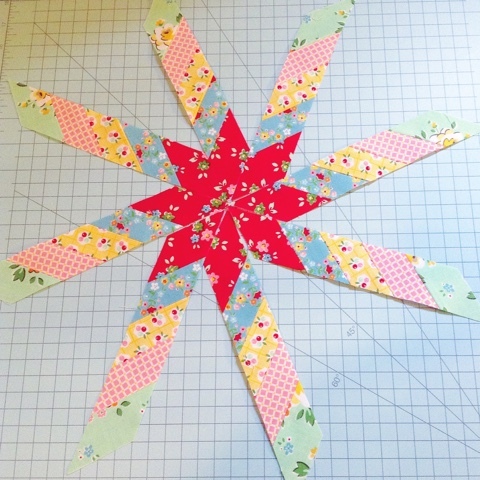 I made some Churn Dash blocks to go around the center star. I liked it a lot. I was going to add Lemoyne Star blocks to the corners of that round. I laid it out and let it sit for a few days. I decided on simplicity instead and made a wall hanging to showcase the Lone Star. 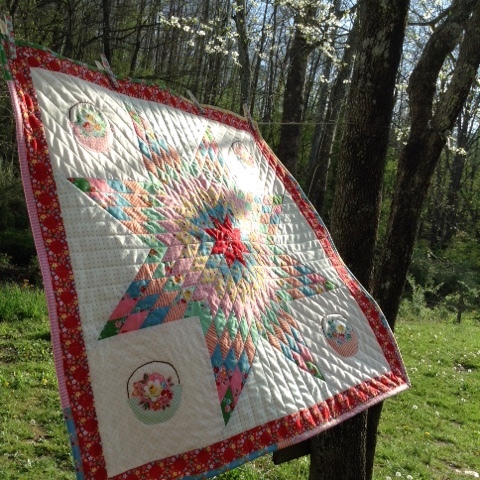 I quilted in the ditch following the star's seams as my guide. I was going to stipple but I was afraid it would take away from the star. I used a scrappy binding and I think it turned out really cute. 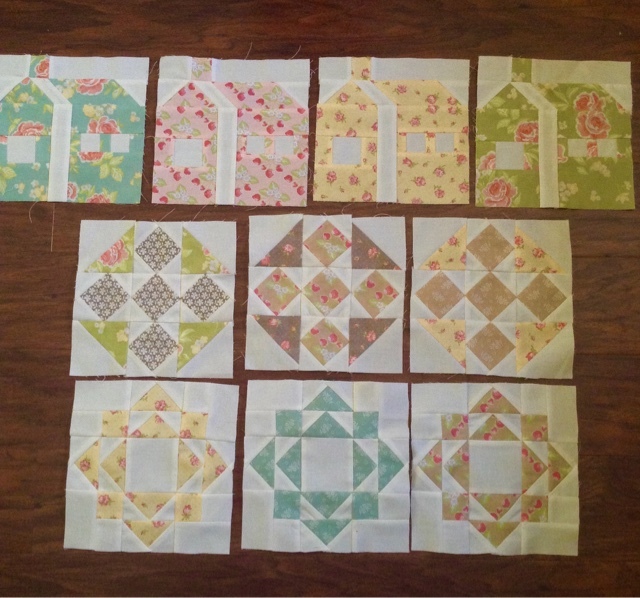 I have plans to use those Churn Dash blocks and appliques pieces for another quilt. 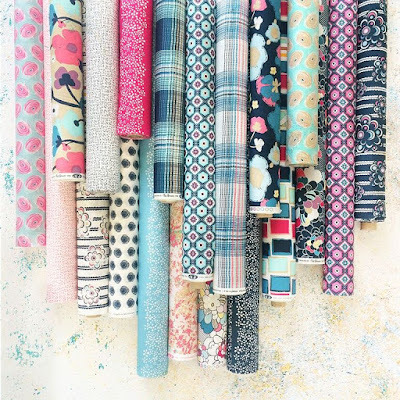 I am going to use every little scrap of this beautiful fabric! Thanks so much to Nadra for asking me to be part of this fun blog tour! 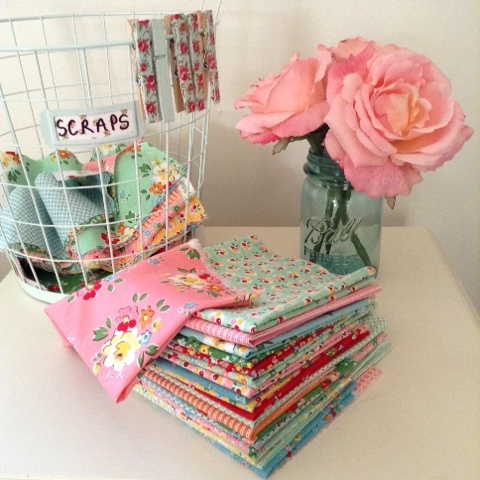 Please check out the other bloggers sewing pretty things with Backyard Roses! 4/21 - Simple Simon & Co.
Good morning! 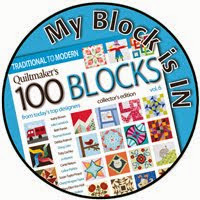 Today a new block is available for download for the Crossroads Quilt Along with Fat Quarter Shop and Joanna Figueroa benefitting the March of Dimes. The new block is called Friendship. 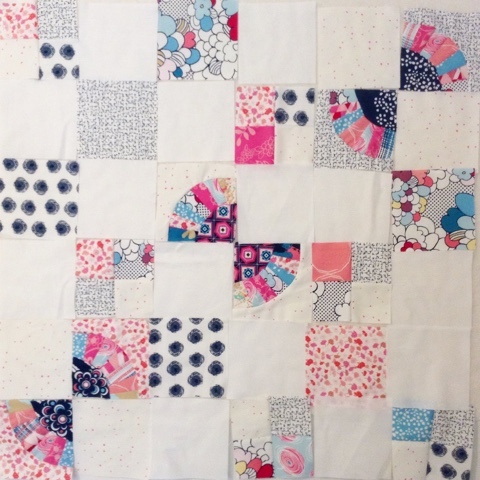 For the quilt you will be making three blocks. 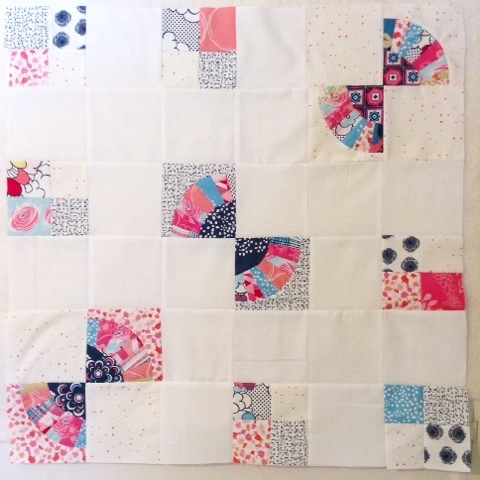 The block is simple to put together. 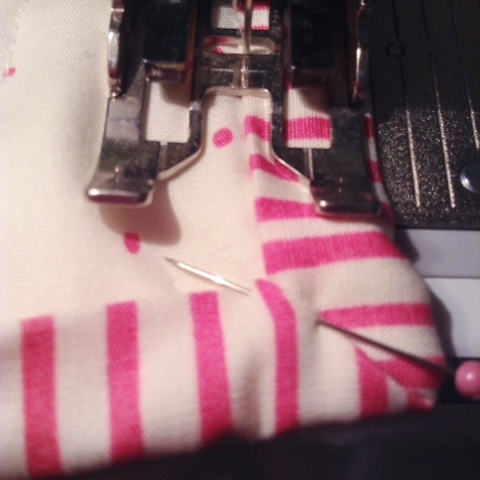 I used pins when putting my rows together which I don't always do but it keeps all of those seams lined up just right. 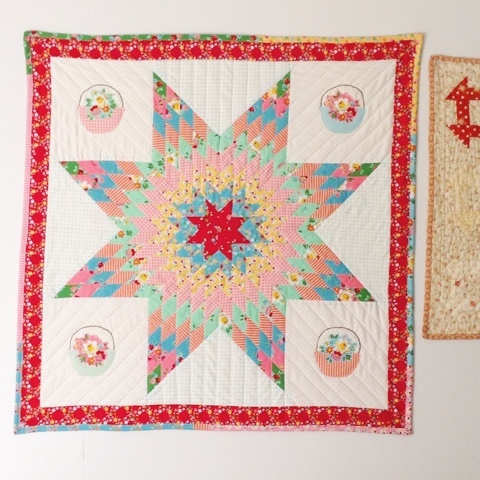 Here are all of my blocks so far made with Strawberry Fields Revisited. I'm so excited to see this one finished. 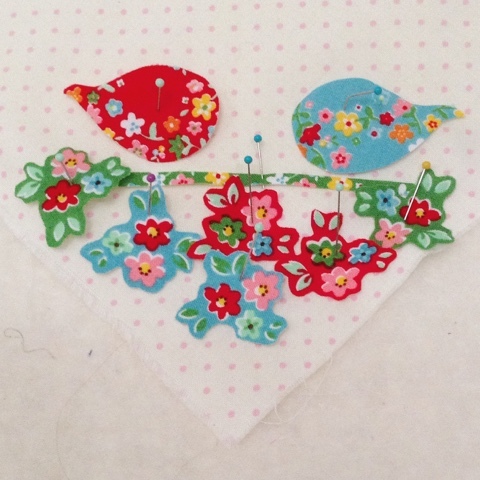 Here is the list of other bloggers sewing along. 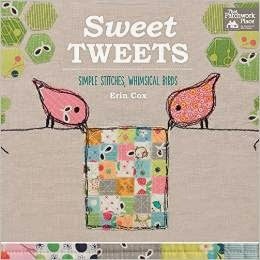 Don't forget to share your blocks on social media using the #crossroadsquiltalong hashtag and on the Facebook group HERE.